UPDATE: ELECTIONS POSTPONED to April 30-May 2nd! 1) GET INFORMED! This year the Organizing Committee recommends the Impact Slate, and write-in candidate Ray Noll for Graduate Liaison. See below for information on both! 2) GET OUT THE VOTE! Tell your department, your friends, your world that this election MATTERS to GSU and all graduate students! We have a quick vote guide for printing and distributing below! As graduate students we don’t often interact with student government. We are required to pay quarterly student life fees but have little voice in how our money is spent. This year, however, we have the unique opportunity to vote for a progressive slate that will actively work with GSU to improve the conditions of graduate student life. A few minutes of your time now could have a huge impact on all of our lives next year. This year, GSU is also running a write-in candidate for Graduate Liaison to the Board of Trustees: Ray Noll. Her only opponent is a Booth student: YOUR vote can help ensure that YOUR voice is heard. This year graduate students are likely to be the swing vote in the election. It’s a close race, and we are the wild card. Impact, a slate of undergraduates who have actively supported GSU campaigns in the past, is running on a platform that actively advocates GSU’s work and would provide several opportunities in the coming year to participate in shaping campus life to provide a more supportive environment for working and learning. Not only do they support our explicit goals of unionization, more affordable health care and childcare, but they are also running on initiatives to improve services for students with disabilities, the sexual assault policy, mental health services, and getting students in administrative decision-making processes — all concerns of our members that we could have more power to improve. GSU is running write-in candidate Ray Noll for Graduate Liaison to the Board of Trustees. Ray is a Departmental Organizer from Political Science working on our Charting, Mapping, and Recruitment Committee, ready to work in SG to increase transparency and accountability within the administration. Ray is running against only one candidate, a Booth student who is on the ballot, and who shares a slate with UChicaGOLD, which includes another Booth student. The third slate, Ignite, is led by the current SG vice president. It’s going to be a close race, so vote! We are asking GSU members to spread the word in their departments—by holding a departmental meeting, making an announcement over email, and/or having conversations asking and reminding people to vote. We will also be flyering outside of the Regenstein, asking folks to vote and talking to them about graduate student issues. Please sign up to participate here. 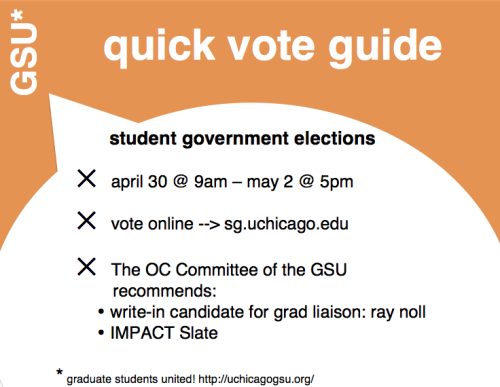 Go to sg.uchicago.edu between April 30 @9am and May 2 @ 5pm and BE THE GSU SWING VOTE!